October 2008 - First rescue boat of N-East Brazil operating at Ilha do Guajiru! Latest as from November, Iha do Guajirú will start operating the first full y equipped rescue service of almost all the N-East Brazilian coastline! 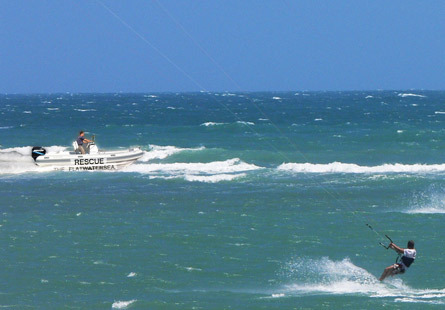 Whereas traditional watersports area's such as Cumbuco, Paracuru, Jericoacoara etc DON'T OFFER ANY RESCUE SERVICE!!! at all, the management of Ilha do Guajirú decided it finds this unacceptable and irresponsible towards all appreciated visitors. Due to this, the management purchased a super fast, wave- and flatwater capable rescue boat, which will operate from here onwards at the island, it's lagoon, the river and the open sea. The rescue service will be operated by the BLOWN AWAY sports resort, that starts to take function early October 2008 now. A full service of the rescue boat during your holidays, can be obtained for your entire stay and holiday through all pousada's and the BLOWN AWAY staff, found at Praia da Barra, Ilha do Guajirú. The charge is very limited and charged per day (Euro 5,- per day), but anyone, needing service without having registered and paid to this service, will be helped (ofcourse :-) but will be charged afterwards Euro 50.- per each time the boat is required to run out and attent you. So, appreciate the fact that the management arranged this, and also support the rescue boat service and agree to pay, you won't regret it the first time you are really in trouble!